What Really Is An EB-5 Direct Investment? The EB-5 Visa, also known as the EB-5 Immigrant Investor Visa Program, is one of the most flexible immigration programs in the United States. Created as a result of the Immigration Act of 1990, the visa enables eligible immigrant investors to become permanent residents of the United States through investing at least one million dollars to both finance a business in the United States and hire at least ten American workers through that business. There are also two different ways to pursue a Green Card through the EB-5 Visa Program, one of which is through the Direct Investment option. This refers to making an EB-5 investment in a United States business that is both established and operated by the investor. The other option is called the Regional Center Program, which means that the investor will send his or her funds to an investment pool (as in the new commercial enterprise, designated by the Regional Center). 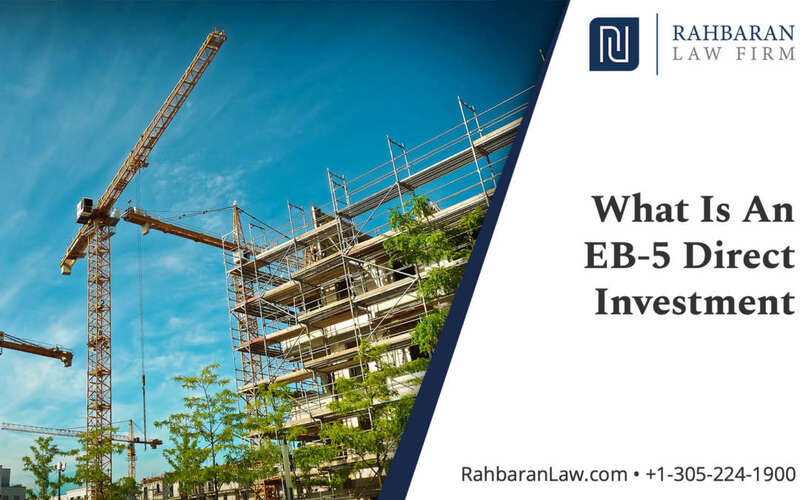 This article will dive into more information on the EB-5 Direct Investment, so you can learn more about what it is and what it isn’t. What Are The Job Creation Requirements of the EB-5 Direct Investment Program? – For a New Commercial Enterprise that is not located within a Regional Center, the job positions must be on a full-time basis and must be created directly by the new commercial enterprise, meaning that your enterprise must be the employer of the employees. – For a New Commercial Enterprise that is located within a Regional Center, the full-time positions created can be a combination of direct, indirect and induced jobs. NOTE: Direct jobs are the ones regulated by an employer-employee relationships, while indirect jobs are jobs that are held outside of the enterprise but are still created as a result of the economic impact of the New Commercial Enterprise. Should You Go With The Direct Investment or Regional Center Option? The Direct Investment is a good choice if you want to own and manage your business in the United States. To achieve the EB-5 Direct Investment Visa, you will either need to be fluent or competent in English and have knowledge of the United States business practices, and you have to be ready to make at least a five-year commitment to your business enterprise as well. In contrast, the Regional Center investment option is a good choice if you want to invest your capital without having the obligation of managing a business by yourself. The Regional Center option allows the investor to live in any part of the United States, without having to be physically present at the New Commercial Enterprise. What Are The Advantages of the Direct Investment Option Over The Regional Center Option? With the Direct Investment EB-5 option, you are not limited to industries that only a certain Regional Center has an interest in. Therefore, you can invest your money in a business or industry that you are passionate about and in any location that you want as well. EB-5 applicants who choose the Direct Investment route will pay lower fees in contrast to the Regional Center option. Marketing costs should be much lower for you as well. Investors in Regional Center projects often see smaller returns on their investment, due to the low-risk nature of the investment. The investor is simply more concerned with obtaining their visa than getting a substantial gain on their investment. In contrast to this, investors in Direct Investments stand a much greater chance of seeing a higher return on their investment, but at a much higher risk. Most of the investors that choose the Direct Investment route are often experts in their industry, and thus are more knowledgeable on how to generate jobs and revenue. In contrast to this, going with the Regional Center option means that you won’t normally invest in an industry of your choice because you will not operate the business. In summary, the Direct Investment option is a better choice for you if you want to own and be involved in the operation of your business, while the Regional Center option is better if you don’t want to devote your time and money into managing a business with the pressure of having to create and maintain ten full-time jobs until you receive your unconditional permanent residency. Either way, the EB-5 Visa Program as a whole is definitely the most flexible and viable way for an immigrant investor to achieve permanent residency in the United States.